Learn about the history of this amazing mine and see first-hand the gigantic scale of its operation, vehicles and artifacts. Discover how ore gets refined to become copper – an essential element in today’s technology. 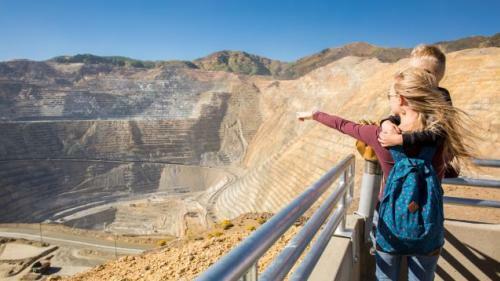 The Visitor Experience is dedicated to educating the public about the importance mining plays in modern life, safe mining practices and responsible environmental stewardship.Founded in 1903, Kennecott’s Bingham Canyon Mine is one of the largest man-made open-pit excavations in the world. The operation is so immense, it can be seen from space. The mine operates 24 hours a day, 365 days a year. 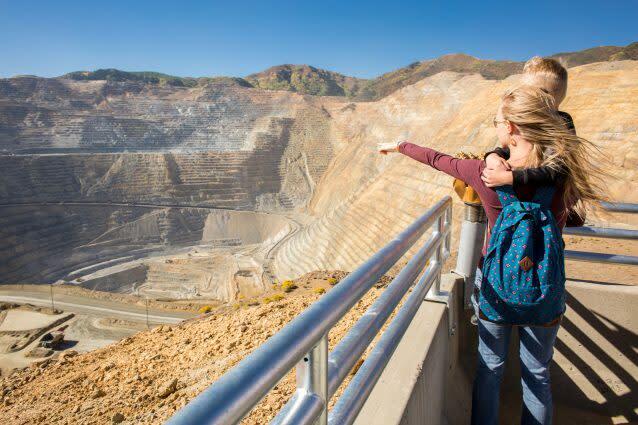 With over 20 million tons of refined copper ore produced in the past 116 years, it’s one of the top performing mines in the world and has provided more wealth for the state of Utah than any other company.Reservations are available for every hour starting at 8:30am. Shuttles to the mine overlook depart from and return to the Lark parking area every 30 minutes. The last shuttle departs at 3:15 pm and returns by 4:30. Walk-up ticket purchases are available at the Bingham Canyon Lions Gift Shop.Drinks are available for purchase via vending machines. Food is not currently available at the Visitor Experience.